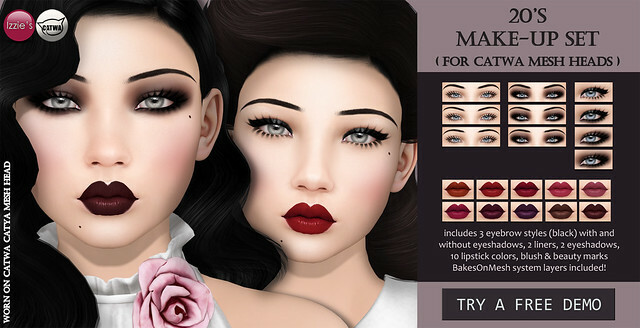 Izzie’s released a 20’s Make-Up Set for Catwa heads at the Artful Decorum round of TLC! The set includes 3 eyebrow styles in black with and without eyeshadows, 2 liners, 2 eyeshadows, 10 lipstick colors, blush & beauty marks. BakesOnMesh system tattoo layers are included as well. Please try a free demo before purchasing – there are demos at Izzie’s mainstore as well!